This year’s Easter, we treated ourselves to prime ribs when Costco was selling it for Easter. My first successful prime rib, although has a flavor crust and delicious, was over cooked around the edges with a pink meat center. Last Christmas, I roasted prime rib again using another “formula”, one from the magazine, The Costco Connection, as it says the recipe produces rosy pink tender meat from surface to the center… the only problem is that since it uses low temperature during the whole roasting time, there’s no crust on the surface!… So, I combine the two recipes– and it works, at least for me! I got the best of both worlds– tender, juicy, pink meat from surface to the center, and a flavorful salty crust! Preheat oven to 500°F. Place oven rack to lower half (so the roasting pan is positioned in the middle of the oven). Let the meat stand in room temperature for a few hours. If you age the meat, trim off discolored fat and meat. Coat the meat with cooking oil, then rub the seasoning generously all over the meat. Place the meat on a roasting rack, bone side down, inside a roasting pan. Roast at 500°F for 15 minutes (this high heat is to crisp up the surface to make a crust). Reduce oven temperature to 200°F and continue roasting, about 25 minutes per pound, until the internal thermometer reads 130° for rosy pink meat (see chart below). It took me 3 hours and 15 minutes to reach this temperature). Remove the meat from the oven. Cover the meat with 2 pieces of foil, and kitchen towels on top of it. Let the meat rest for at least 30 minutes. The internal temperature will continue go up for about 5° or so during resting time (in my case, the thermometer read went from 130° to 135° during resting for medium cooked meat). Separate the roast from the bones. 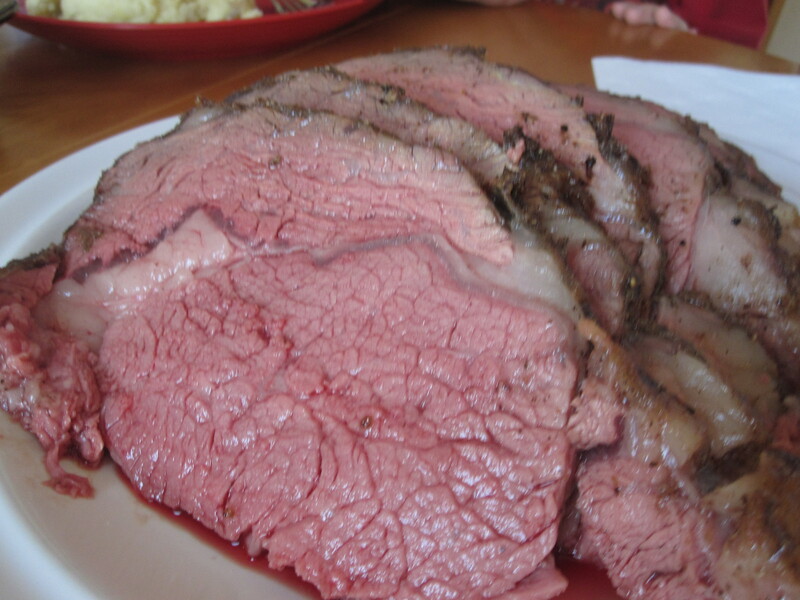 Carve the roast and serve with au jus (see below). To make Au Jus: Remove excess fat from the roasting pan and deglaze with 1 can of chicken broth, cook au jus on the stove until reduced by half. Season with salt and pepper to taste. To Age Rib Roast: Rinse rib roast then pat dry with paper towels. Wrap the meat with paper towels and place it in a shallow pan in the fridge for at least 3 days. The longer it ages the flavor gets better. Change the paper towels everyday. On roasting day, trim off any discolored and/or dry part of the meat before coating with oil. This soup is good to have on cold days. It will warm up you stomach. 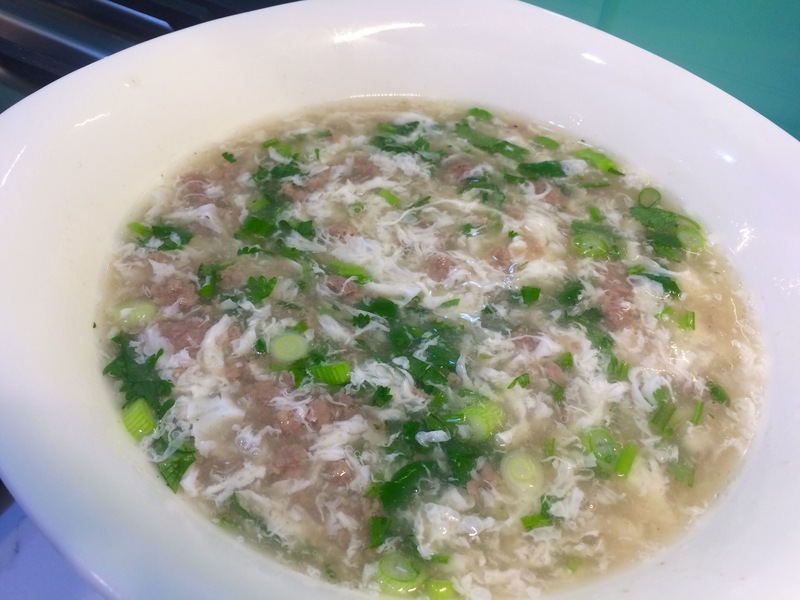 Winter is approaching and more and more fresh daikons are on sale… I’m sure I’ll be making this soup again soon. 1 lb daikon– peeled and cut into chunks. Add peppercorns, ginger and water to a deep pot. Let it boil for 10 minutes for the flavor to come out. Add beef and cooking wine and boil on high heat for 20 minutes. Transfer soup and meat to a slow cooker. Place a kitchen towel on top of the lid to speed up cooking. Cook in slow cooker on high heat for 3 hours, then add daikon. 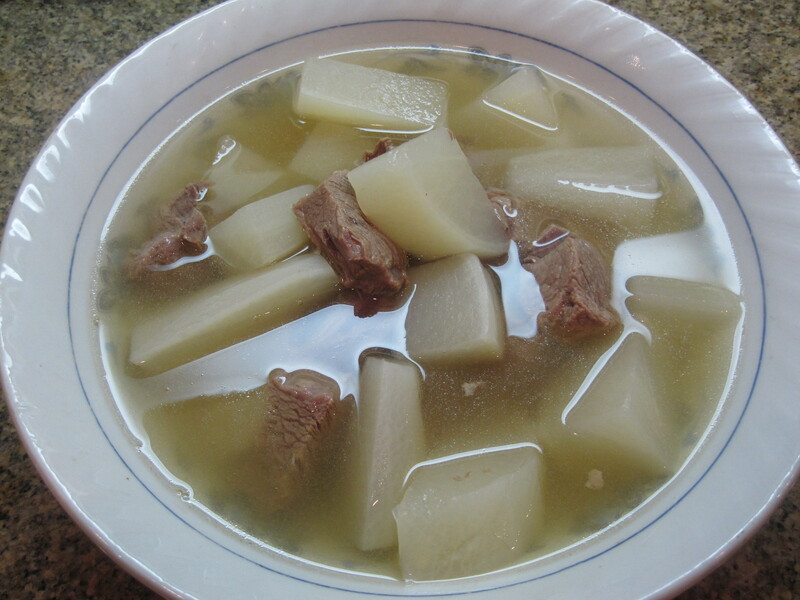 Continue cooking for another 1-1.5 hours, until daikon and meat are tender. Salt to taste.